With no new album or tour during the first 10 months of 2014, Pierce the Veil capped off last year with social media growth that was remarkable, illustrating the band’s exceptional and expanding fan base. Between late August and the first week of January, the band racked up nearly 80,000 new Twitter followers (now 1-million-plus, in addition to the 2.5-million followers the four individual band members have collectively), 191,837 new Facebook likes (now 2.960-million), and their music video for “King For A Day” (featuring SWS’s Kellin Quinn) has gone from 33-million views to an astounding 41-million-plus views (bringing PTV’s total YouTube views to more than 84-million). Plus, in its year-end review, Tumblr announced the top 20 most reblogged bands, placing PTV at #6 and aligning their social media popularity with Platinum and multi-Platinum-selling bands 5 Seconds of Summer, One Direction, Fall Out Boy, My Chemical Romance, and All Time Low. 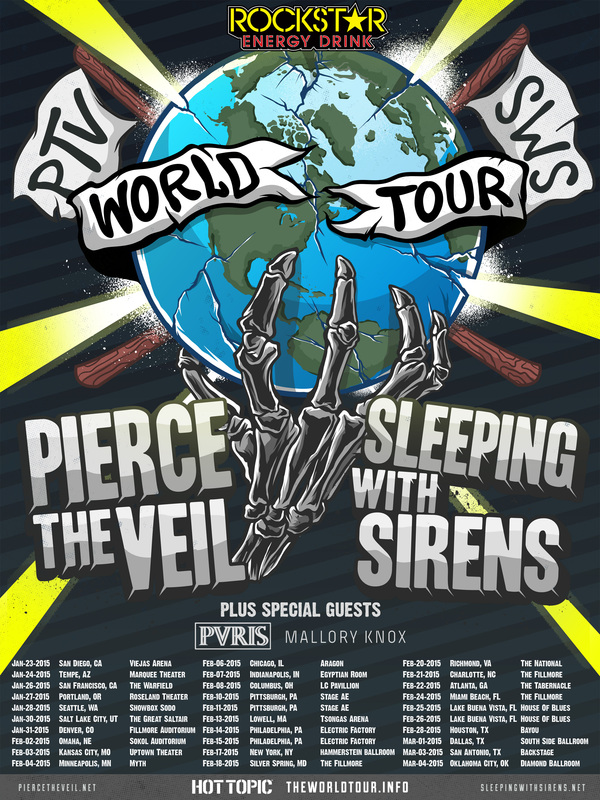 And PTV is still a developing band. Sleeping With Sirens has been preparing for the release of their fourth album, working with producer John Feldmann (The Used, Panic! At The Disco, Good Charlotte). “Kick Me”, the first new single released in late 2014, peaked at #1 on Billboard’s Trending 140 chart. The music video for “Kick Me”, filmed with fans at an intimate London show last fall, has cumulated over 3 million views. The band kicked off 2015 by offering new track “We Like It Loud” as a free download to fans for a span of 24 hours, garnering over 50,000 downloads. Even with 102 million streams, 83 million music video views, millions of social media followers, hundreds of thousands of tickets sold around the world, over 715,000 in combined album sales and a #3 debut on Billboard’s Top 200, Sleeping With Sirens maintains a firm grasp on their musical identity, with an authenticity that draws bigger and bigger crowds. “The biggest foundation for all of us in the band is to stay true to ourselves,” declares Kellin Quinn, “We all sleep well at night knowing these are the songs we believe in. Our focus was in putting out an album like the ones we grew up listening to, the music that changed us.” Fans can expect new music from Sleeping With Sirens soon.